Living in New York for almost thirteen years has messed me up. Among my many strange, city-inflicted maladies is a powerful irrational fear of of very large rooms, brought on by a decade-plus of existing exclusively in tiny spaces. There's something about having too much distance between my head and a ceiling that unsettles me. Example: I went to a Costco when I was in Dallas last year and almost lost my sh*t. Being in an airplane hangar full of socks and frozen pizza somehow just made me all too aware of my human insignificance. Aside from the existential crisis, American Cut had a similar effect on me. 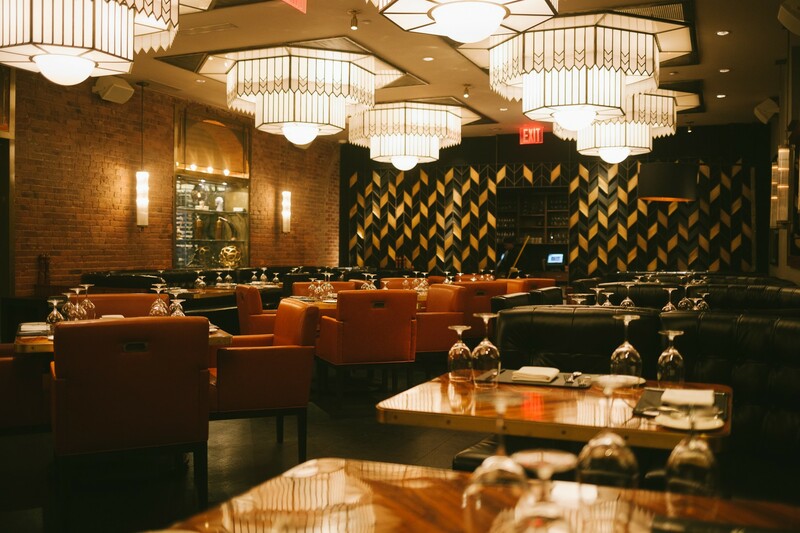 This Tribeca steakhouse from Marc Forgione is absolutely massive, especially by downtown Manhattan/not Texas standards. If you're ever looking for somewhere to host dinner for about 400 bankers, this is it. You can also probably book that reservation two days out. The sheer size of this place makes tables easy to come by. Even big ones. What's interesting is that even though American Cut is a frighteningly large steakhouse that is often half full of suits, we really like it. This restaurant is far more Forgione than it is Del Frisco's, and that means the food is good and inventive, even though it strays little from the standard "steaks-equal-man-food" blueprint. You will find the legendary Chili Lobster from their sister restaurant on the menu, and the sides and salads display creativity beyond creamed spinach. The service and wine list are also very good, and the room is warm and laid back. In many ways, American Cut reminds us of another favorite steak destination: Strip House. Hit it for the next time you need a big baller night out and a tomahawk chop - or just a reminder that the world is bigger than the inside of your studio apartment. If you've been to Marc Forgione, you know this trademark dish. The lobster sits in a spicy Southeast Asian red sauce, and comes with a side of Texas toast for sopping. Skip the seafood tower and order three of these instead. For the type of person that isn't satisfied just eating the cow's muscles, here's the opportunity to eat it's life essence. We're always down for some marrow, and this was as good as we hoped it would be. No idea what unnatural process causes this carrot to be glazed with itself, but it tastes pretty good, so I'm down. The real question is, how do you feel about spending $12 on it? This is the potato side you want on your table. The latkes come stacked tall, and they're salty, delicious, and a little less heavy than the other potato options. A little. Anyone who knows anything about meat will tell you that it's always better when cooked with the bone on. We'd love to tell you that's why we think you should order the tomahawk at American Cut, but let's be honest. It just looks awesome. It tastes good too. Congratulations! You made it through an entire steakhouse meal without having a stroke. Reward yourself with this glass full of popcorn ice cream. You definitely need it.